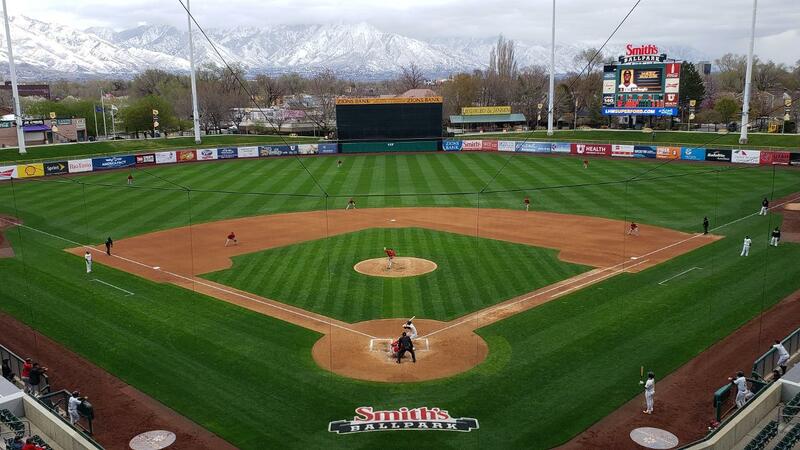 Salt Lake City, Utah (Wednesday, April 10) - After a rainout on Tuesday night, the Fresno Grizzlies (5-1) and Salt Lake Bees (1-5) attempted to play two on Wednesday at Smith's Ballpark, before the second game was suspended by rain after three innings with the Grizzlies leading 8-1. The early onslaught inlcuded Carter Kieboom's first Triple-A homer (2-run) in the second inning. That and the rest of the individual stats will not be made official until the second game is completed during Fresno's next trip to Salt Lake City, June 20-24 (exact resumption date is TBA). In the opener on Wednesday, Jake Noll's solo home run, an opposite field blast to right in the first inning turned out to be the game-winning hit in a 2-0 Fresno victory. Alec Keller added the second run with a bases loaded sacrifice fly in the fifth. Noll's homer was his first of the season and of his Triple-A career. Right-hander Kyle McGowin made everything stand up by tossing 5.2 scoreless innings, scattering only four hits without a walk, striking out six. The Grizzlies are now 2-0 this season with McGowin on the mound, as he picked up his first winning decision of the 2019 campaign. Lefty Vidal Nuno converted a four-out save to secure Fresno's fourth consecutive victory, keeping the Grizzlies in first place in the Pacific Northern Division as the PCL's opening week comes to a close. ON THAT FRES-NOTE: Fresno's Game 1 win was the first time Salt Lake was shutout in a home opener. Under nicknames "Buzz," "Stingers," and "Bees" since Salt Lake joined the PCL in 1994, Wednesday was their 26th home opener in the Beehive State. Thursday's starting pitching matchup will be an all-University of Washington alumni affair. Fresno's Austin Voth pitched three seasons for the Huskies before turning pro; as UW's Friday night starter during his junior season (2013), he posted a 2.99 ERA in 17 games (15 starts) over 105.0 IP. Voth's 98 strikeouts in 2013 ranked second in the Pac-12 Conference, behind only future/former Grizz Mark Appel (2015). Probable Salt Lake starter Forrest Snow was not a teammate of Voth's at Washington; he pitched three seasons at the school as well from 2008-2010 before being drafted by and signing with the Seattle Mariners following his junior year.